On Christmas Eve, days before snow began to fall on New York City, Transportation Commissioner Janette Sadik-Khan and Sanitation Commissioner John Doherty were on the phone. The winter weather watch had not yet been issued by the National Weather Service. Doherty and Sadik-Khan talked about their options for the looming storm, which at that time was supposed to bring several inches to the Big Apple. Deputy Mayor Stephen Goldsmith, who oversees both agencies, was in Washington, D.C. To this day, it is unclear where Mayor Michael Bloomberg was. A day later, on Christmas, the National Weather Service upgraded the city’s storm warning to a blizzard at 3:55 p.m. It defiantly told New Yorkers: “Do not travel.” It warned the city could see high winds and up to 16 inches of snow. On Dec. 26th, two days after their first conversation about the storm, the two commissioners decided not to call a city snow emergency — a rare designation that would force certain residents to move their cars off narrow streets and prohibit driving any vehicle not equipped with chains or snow tires. They did not tell Goldsmith or the mayor about their decision. This one decision, officials said today, created a serious snowball effect that ultimately left the city unprepared to deal with the now-infamous Boxing Day blizzard. “We didn’t want residents to take those cars out, start looking for a parking space — we all know in New York City it’s very difficult to find — and then [create] more problems that we were trying to avoid,” Doherty told the City Council this afternoon at the first of seven hearings on the blizzard response. Every agency head involved and 42 council members attended today’s hearing, including Council Speaker Christine Quinn who normally sits out of the hearing process. In retrospect, Goldsmith said this afternoon, the decision to call a snow emergency would have acted like a “catalyst,” triggering other agencies to respond with speed and seriousness to the storm. Instead, between Dec. 26 and New Year’s Day, Bloomberg administration officials scrambled to keep up with the 20-inch snowfall, which left ambulances, buses and abandoned vehicles stuck in unplowed streets. Officials acted without a concrete chain of command and City Hall failed to get a complete picture of how bad the situation really was, Goldsmith said. “The mayor did not have the information he deserved,” Goldsmith said, contending there was a communication breakdown between city agencies. “I accept responsibility in doing that more rigorously in the future,” he added. Goldsmith, a former mayor of Indianapolis who joined the administration last spring, promised to never let it happen again. As part of that pledge, the administration unveiled a 15-point plan to prevent similar slow responses. (More on that plan here.) They will have an opportunity to test it tomorrow. Snow is expected to start accumulating tomorrow evening, and by Wednesday night we could have another foot on the ground. Sandy Hornick, director of strategic planning for the Department of City Planning, defends the city’s record on encouraging mass transit use in a comment posted today. Hornick also cites an array of actions by the Bloomberg administration that, he says, encourage the use of transit, as well as biking and walking. These include rezonings, limits on curb cuts and efforts to make streets more attractive. Hornick’s comments are the latest entry in a debate sparked by Paul’s article. To read Hornick’s post and the others on parking and auto use, go here. Watch out, there may be some rough roads ahead. After snowstorms and other winter wear, some New York City streets have come to resemble war-torn terrain and not the byways of a well-kept metropolis. 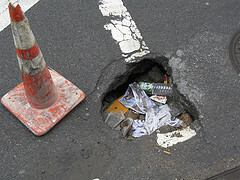 Now Gotham Gazette and The Huffington Post want to know what kind of craters mark your streets. Is your block a virtual obstacle course? Has your car or bike tire exploded thanks to an avenue’s neglect? Send us photos and addresses of neglected roadways in your neighborhood, along with any other lurid details you care to provide, and we’ll report back next week. The Bloomberg administration released its first ever street-level air survey chronicling the air quality in every borough. The survey showed that Manhattan’s high traffic areas have the worst air quality. The survey compiles data, including measurements of particulate matter, nitrogen dioxide and elemental carbon, gathered from 150 sites throughout the city last winter. The survey was conducted as part the mayor’s PlaNYC 2030 — his vision for sustainability in the five boroughs. The level of pollutants correlated with the level of traffic and building fuel use, according to the survey. All of these contaminants are associated with health problems, like asthma and emphysema. Just last week, the City Council approved legislation to force large buildings in the city to conduct energy audits every decade. 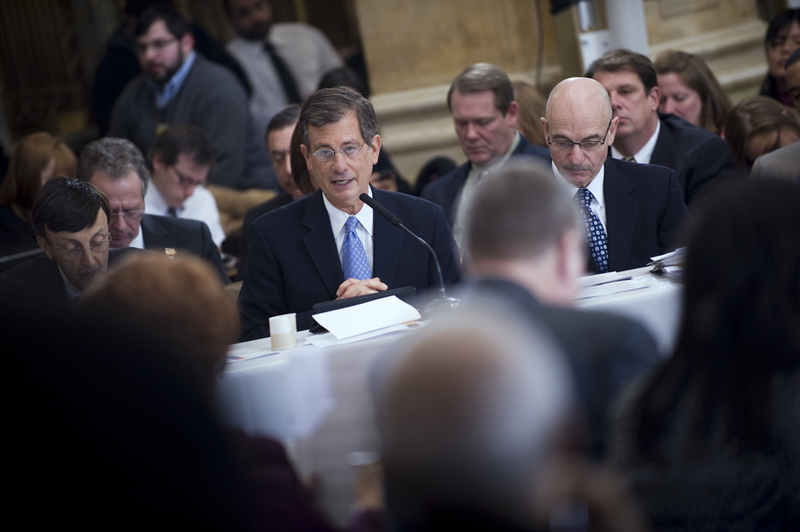 When first introduced, the bill would have also required those buildings to implement the audits’ recommendations, but it was retooled following criticism by property owners. It does require those buildings to conduct maintenance to reduce their energy consumption. As the Yankees set to play their first official regular season game in their new stadium, Gotham Gazette parks writer Anne Schwartz offers the following modest proposal to help the state budget. (For more on the delays in plans to replace parks in the Bronx, see her article, Yankee Stadium Is Opening, But Not the Parks. Three of the garages are either under construction or complete. The fourth is slated for Jerome Avenue and 161st Street, where the parks department built an interim synthetic turf baseball/soccer field and track for the community, pending the completion of replacements for the 22 acres of public athletic fields that were taken over for the new stadium. The first partial replacement park –- a football/soccer field ringed by a 400-meter track –- should be finished this month. At that point, the interim field will make way for the fourth parking garage. Baseball teams in the neighborhood will have to wait for new fields until the old stadium is razed and a park is created on its footprint, two and a half years from now. How necessary is all that parking for 81 days a year? (OK, plus a few more if the Yankees go into the post-season.) The stadium is served by two subway lines and a brand new Metro North station. Wouldn’t taxpayer money be better spent on keeping afloat the mass transit systems essential to the functioning of the city’s economy? Why not at least postpone the construction of the last garage and leave a nice new playing field for the neighborhood kids? The Bronx and Staten Island. Check, check. These boroughs are now transporting their trash by rail or barge as part of the city’s Solid Waste Management Plan approved by the City Council in 2006. Mayor Michael Bloomberg announced in East Williamsburg this morning that about 950 tons of waste from Brooklyn Community Boards 1, 3, 4, and 5 will be taken by rail from the Varick Avenue transfer station daily. All of that trash had previously been taken by tractor trailers, which spew out far more noxious and harmful fumes in the area. 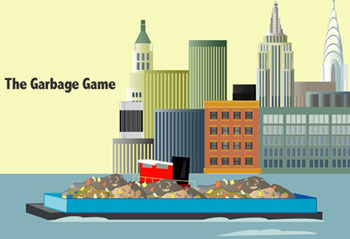 We took an in depth look at the city’s garbage plan with The Garbage Game. See if you can design the city’s solid waste management plan.